Last year, I took Butler to the final game. But this is not last year, and I reminded myself of that fact as I filled out my bracket. 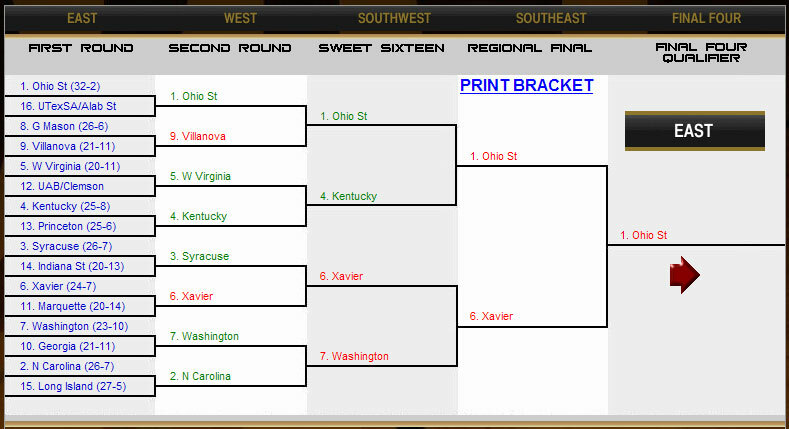 I knocked Butler off in the second round, same as VCU. Kentucky and UConn? I wasn’t feeling them, either. I eliminated them in the Sweet 16 and regional final, respectively. So, for my bracket, the NCAA men’s basketball tournament is over. Fortunately, I still have a shot in the annual ENF employee per capita contest. We have our own version of March Madness at the ENF office. As the close of the fiscal year approaches, we all compete to see who can come closest to predicting the final mark for per-member giving. The winner gets bragging rights and a coveted spot in the exclusive club of former champions. The defending champion is Paula Lukos, one of our gift processors. She won last year with a guess of $6.300. The final per capita was a record $6.324. You’ll note that with the exception of Development Manager Kate Edsey, we all predicted a new record. Is Kate’s pessimism a result of insider knowledge? Nope. It’s a typo. She claims that the three was intended to be an eight. My guess is not really a guess. It’s our fundraising total through February 28 plus the average March take over the past three years. That puts us at exactly $6.597. Development Associate Erin Rohan got to pretty much the same place just by adding $1 million to our February 28 total. We’ve topped $1 million in six of the past seven Marches. The three-year average says we’ll fall just short this year. The three-year average is one of three indicators that I track throughout the year to measure our fundraising progress. I also look at the eight-year average (which predicts a final per capita of $6.623) and the first five years of the eight-year period ($6.638). These indicators are usually in the ballpark. Two years ago, with four months remaining in the fiscal year, the three-year average called the final per capita within 0.2 cents. Despite my reliance on trends and sophisticated analysis to predict the future, I’ve managed to win the contest only once in the 11 years we’ve held it. Still, that’s one more time than I’ve ever won an NCAA pool. If you’d like to join the fun, submit your guesses by commenting below with your name and per capita prediction, but get them in before we update again on Friday. You can track the per capita here: http://www.elks.org/sharedelksorg/enf/files/summaryofdonations.htm. * The current per capita, through March 14, is $5.876. * We closed February with a per capita of $5.478. * The record, set last year, is $6.324. * The per-capita calculation is based on a total membership of 892,993. * In six of the past seven years, we’ve raised more than $1 million in March. This is like math class. I'll let the kidletts stab at it! What does the winner get anyway? "There won't be any money, but when you die, on your deathbed, you will receive total consciousness." As of March 27, the per capita was $6.384, which a new per-capita record. It's also bad news for Kate, Brianne, Sandy and Anne, all of whom are eliminated from the contest. Next on the chopping block are Jon and Mary. Let’s see how high the per capita goes as we wrap up the last four days of March gifts. We closed the fiscal year with a record per capita of $6.618. Kristen Scaletta is our winner!